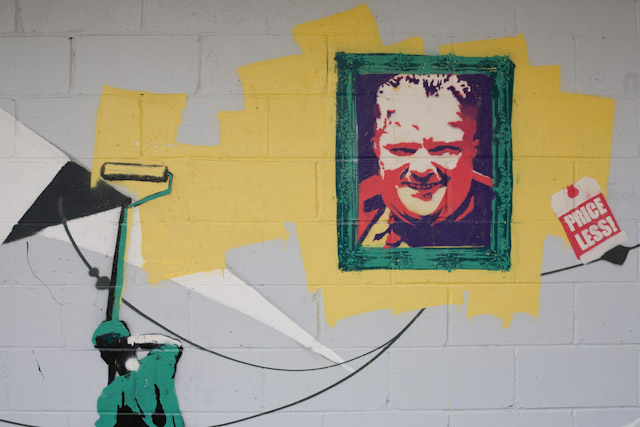 In a back alley just off of Earlscourt Ave at St.Clair West here in Toronto, was the scene a few months ago of our Mayor Rob Ford taking action against graffiti. Here he posed for some media photos doing the grimy work of scrubbing off the graffiti. Afterwards the wall was commissioned by the city by a ‘real’ artist to beautify it. Although yes it is much a cleaner look as before and I personally believe that any commission art by the city is a step in the right direction, another graffiti artist didn’t think so. This unknown artist took the liberty at making a new portrait of our dear Mayor.